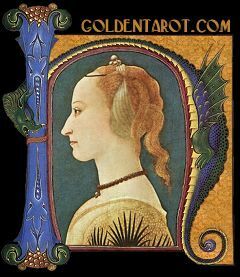 "Golden Tarot has been collaged completely from artwork of the late Middle Ages and early Renaissance. From a time of violence, pestilence and oppression came poignant images of gentle beauty and human frailty. They speak to me of a truth that is timeless, and hope that flowers even in the darkest conditions. I hope that they also speak to you". - Kat Black, artist/author of Golden Tarot. If you're a first time visitor, please read the Welcome page to familiarise yourself with the site. More familiar visitors may wish to read the News, or find what they're looking for quickly using the Sitemap. The Aeclectic Forum (see below) contains the most up-to-date news. If you want to take other people's word for whether it's any good, various online reviews can be read from here. In July 2007, Kat did a podcast interview on TarotConnection.net that you might like to listen to. 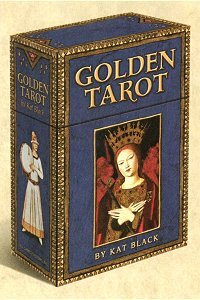 The Golden Tarot Deck & Companion Book are published by US Games Systems. Enquiries about use of images for reviews etc should be directed to USGS. The deck is also listed on Wikipedia and Taropedia, if you have anything to add to those entries.